All the autosolvers did the job. Can you do the same? You don’t know it but I do: I have finished “It’s All Greek”. Totally 35 levels. Didn’t bother making new versions of letters looking like the latin letters published in my collection “Sokoletters“. I ran the collection through the useful autosolvers: Old Takaken, classic YASS and JSoko and new Sokolution. And intend to publish the rest of the letters in order of increasing difficulty. Increasing difficulty from the solvers point of view. Doesn’t necessarily correspond to difficulty from a human point of view. All the autosolvers managed to solve Big Gamma. As allways: Please contact me if you find any flaws (=boxes not needed to move or unnecessary floors). And I will do my best to make a better level. Boxes I announce beforehand or floors just present for the look don’t count. But I don’t think there is much of that in the remaining levels. I proudly announced Pi couldn’t be solved without moving every box. First Brian Damgaard send me a solution using one floor less than designed. And not a floor just for the looks but a floor I thought was necessary. Not very succesfully as it appears. 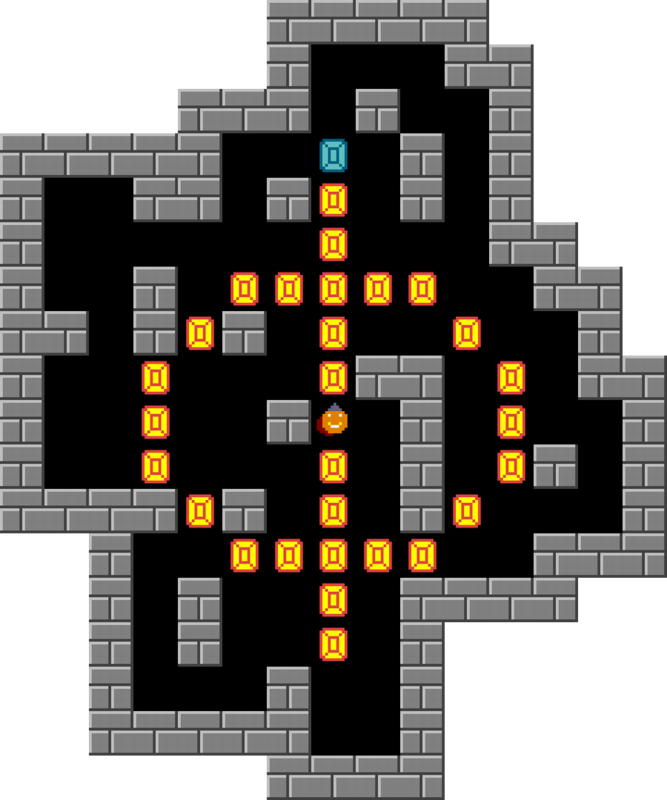 Shortly after publishing the level below Brian Damgaard solved the level without moving the three marked boxes. Four? No. The box at J12 is my own correction. Didn’t even check if all floors were necessary. And before I published this Jordi Domenech send me another solution. So don’t play the level below! 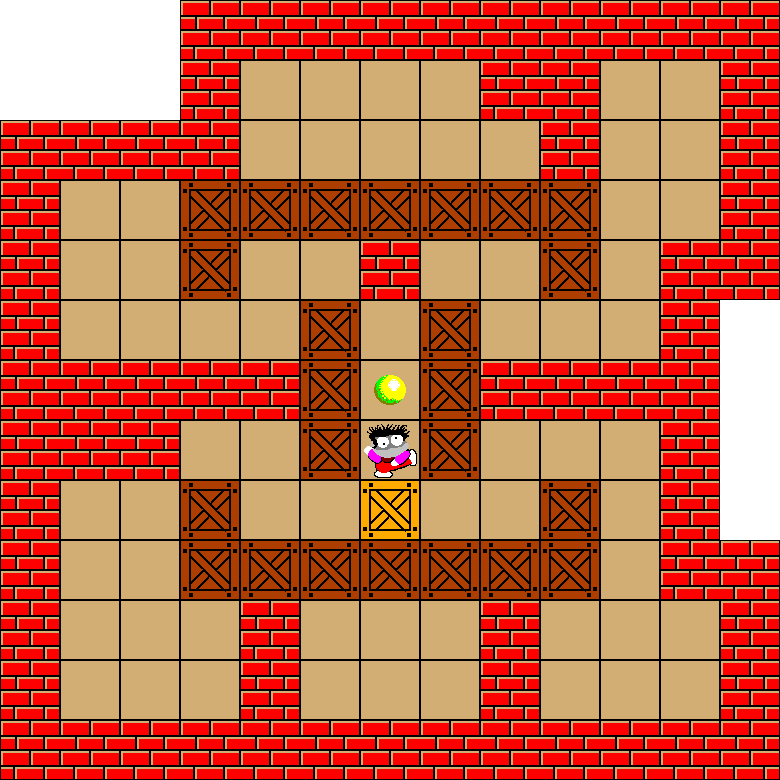 Now I feel more comfortable challenging you to solve the level without moving all boxes and find unnecessary floors. Ever read about Hubris and Nemesis? Comment: Matthias Meger and Anian solved a previous version of Pi without moving one of the boxes at all. Now this is corrected. 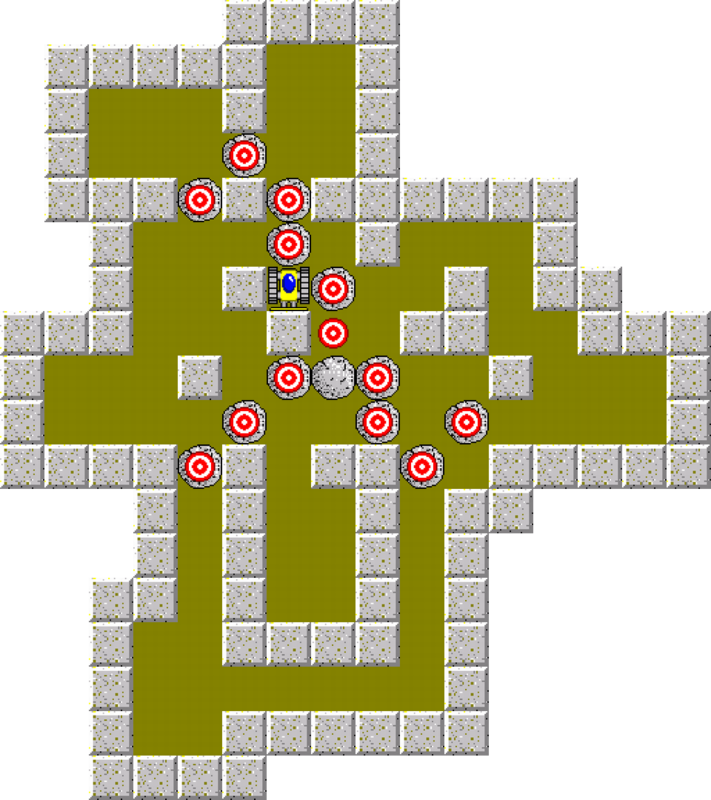 If you find this level difficult you can cheat and use the autosolvers Sokolution or Takaken. 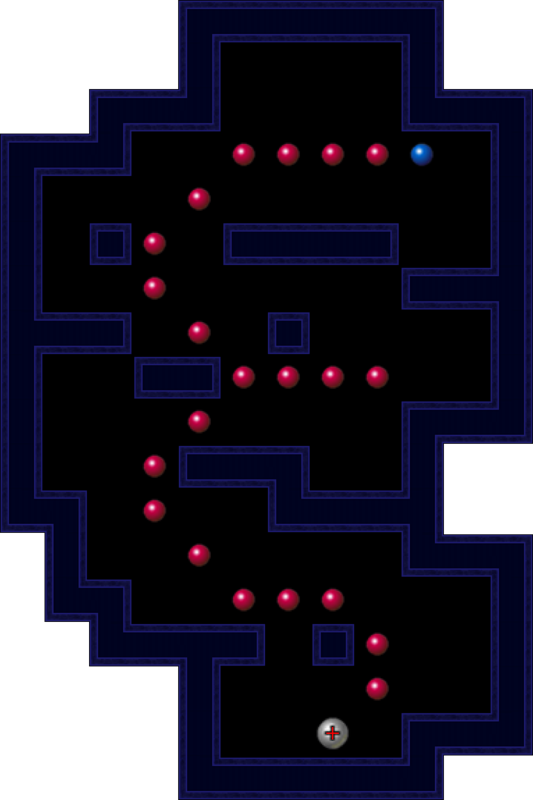 This level is quite easy as the first 80-90 moves are practically one way. Comment: I know there is at least one flaw. Can you find more? 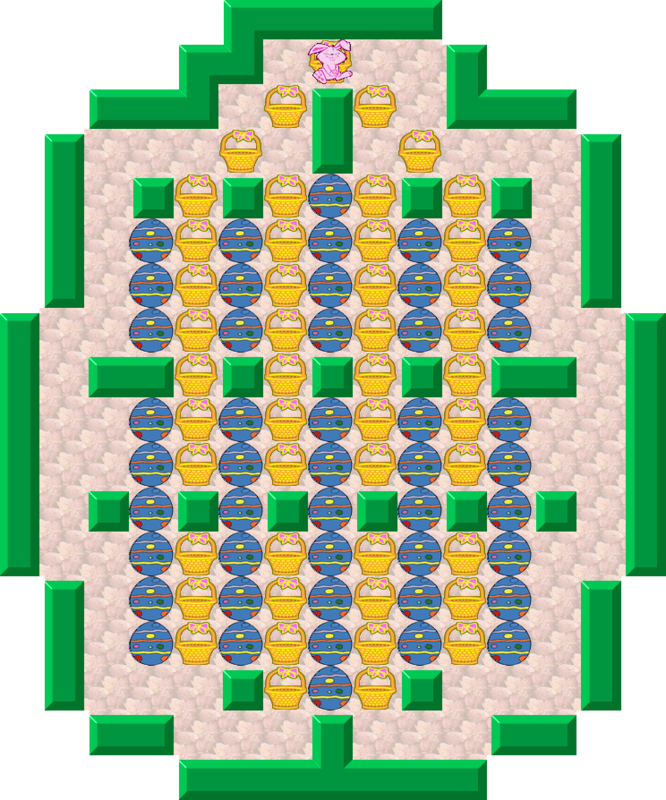 Comment: Not a boring old level created months ago but a brand new level created yesterday. Easy? Do you want something a little tougher? The 110th MF8 Competition started yesterday. Comment: Vacation on Tenerife. 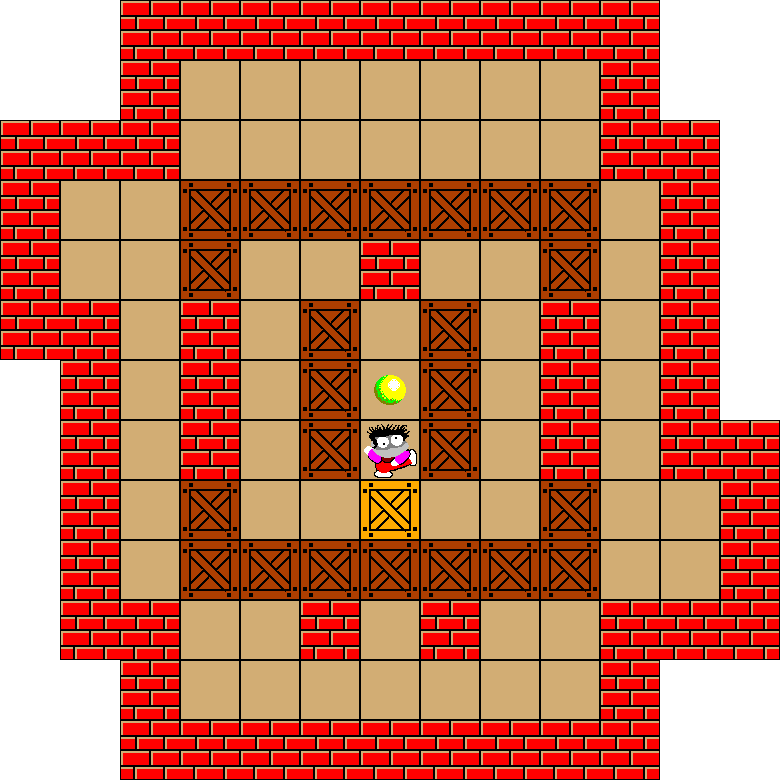 Used some idle time for a Sokoban level. 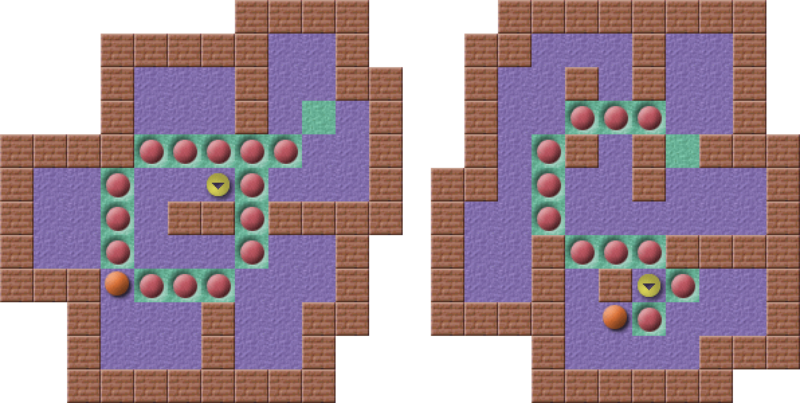 Comment: Usually big levels are hard to make without flaws. 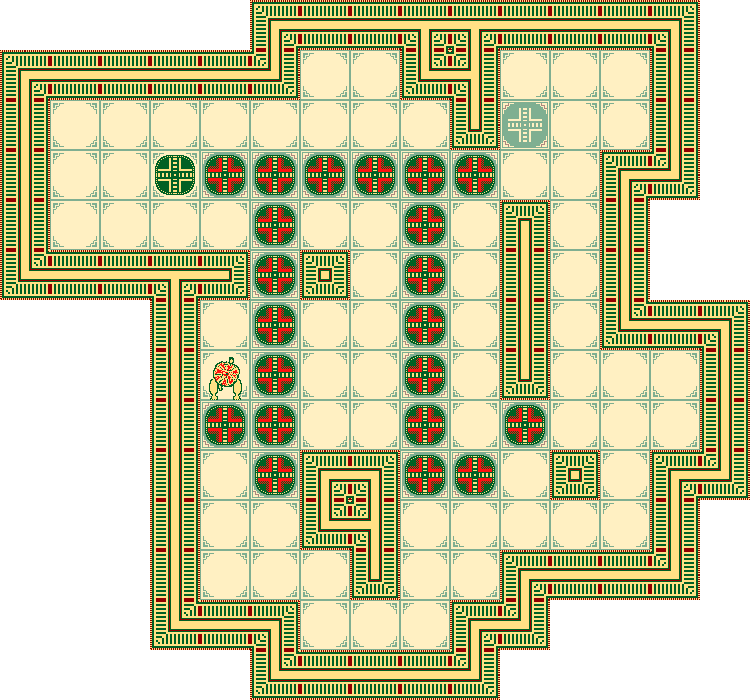 I didn’t find any in this level but that doesn’t necessarily mean there are none. Give it a try. Hope so since there are two acknowledged versions of sigma and you get them both. Happy Easter! Time for the Easter Bunny to roam your screen. Comment: I was in an easter mood a little beforehand. Well. Yesterdays news is yesterdays news and I am probably pretty close to be the only one caring. 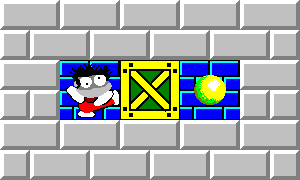 Comment: Took me a long time, but I am sure you can’t solve this level without moving every box. Just got that nagging feeling…and wrong I was. Don’t bother about moving J14. Don’t play this level. It got censored! 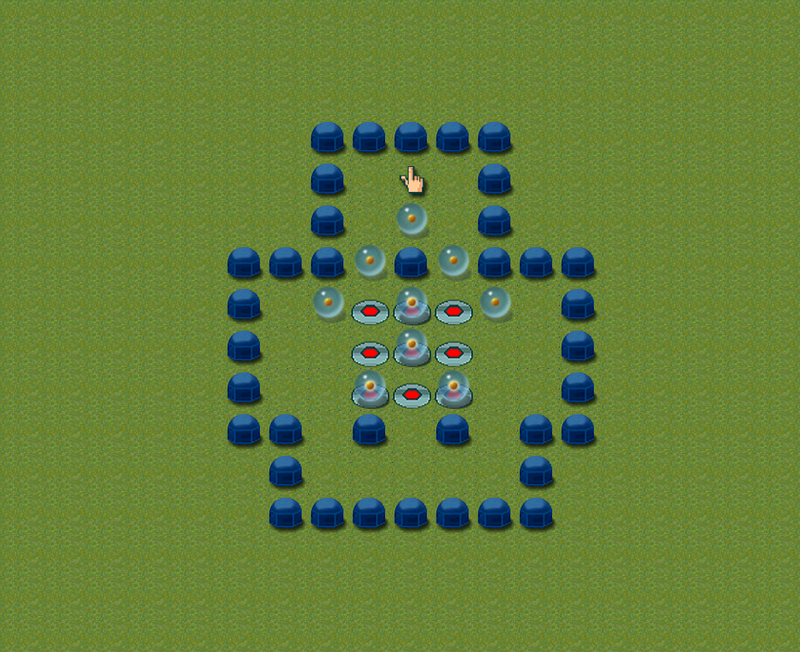 Once in a while I upload a level to SokobanOnline.com. Presents your level nice up front. Uploaded “Blockhead” with this text: “Study for the center of “It’s All Greek – Chi”. Not published yet. Find it at Sokoban.dk in a not far future. 8 Unnecessary floors just for the look”. 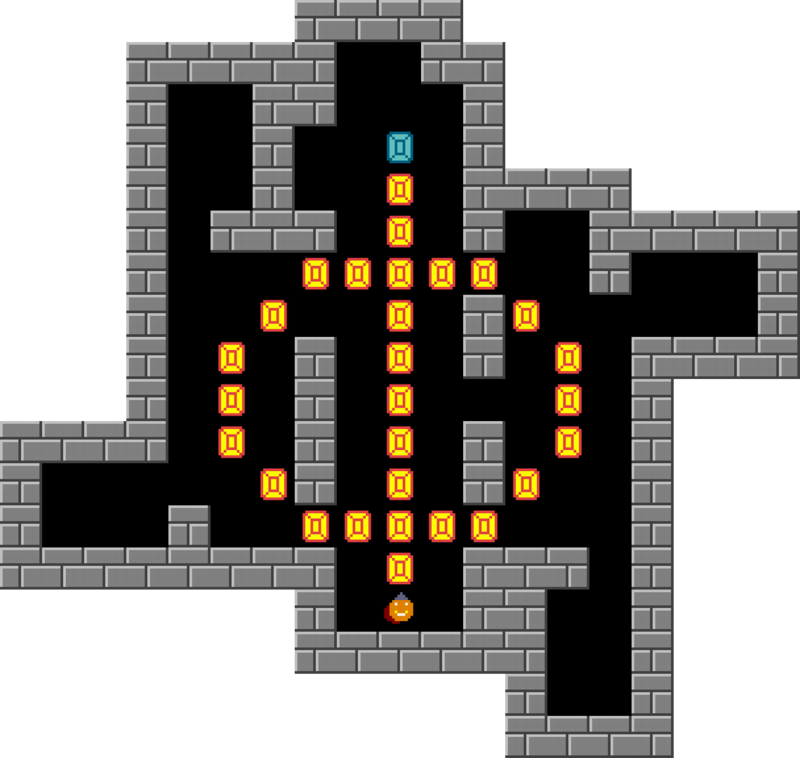 When the level was published the reference to sokoban.dk had disappeared. I wrote a rather nice “complaint/objection” at the site. Gone after less than an hour. And received a mail I was violating SokobanOnlines terms announcing my website at SokobanOnline. Doing it again I will be expelled. That’s perfectly okay. Terms stated. I will not violate SokobanOnlines terms anymore. What is not okay is deleting the “adverticement” and publishing my level anyway without any notice. So I asked to be expelled right away not needing to do the work to violate the terms once more. Deleting my account AND my levels. Wonder if that will happen. I think the money and the competition in Sokoban on the net are so negligible that you really shouldn’t worry to support each other. Better provide a link collection than censorship. Will give more hits and better ratings to everybody. And better business if you are in Sokoban for the money. Comment: Study for the center of “It’s All Greek – Chi”. 8 Unnecessary floors just for the look. Flaw = Box not needed to move to solve a level. 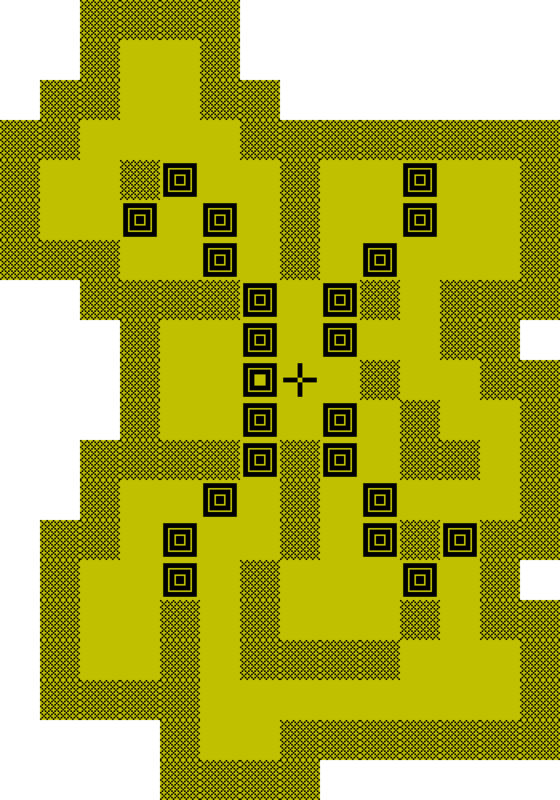 Anian often manages to find flaws in my levels I didn’t find myself constructing them. 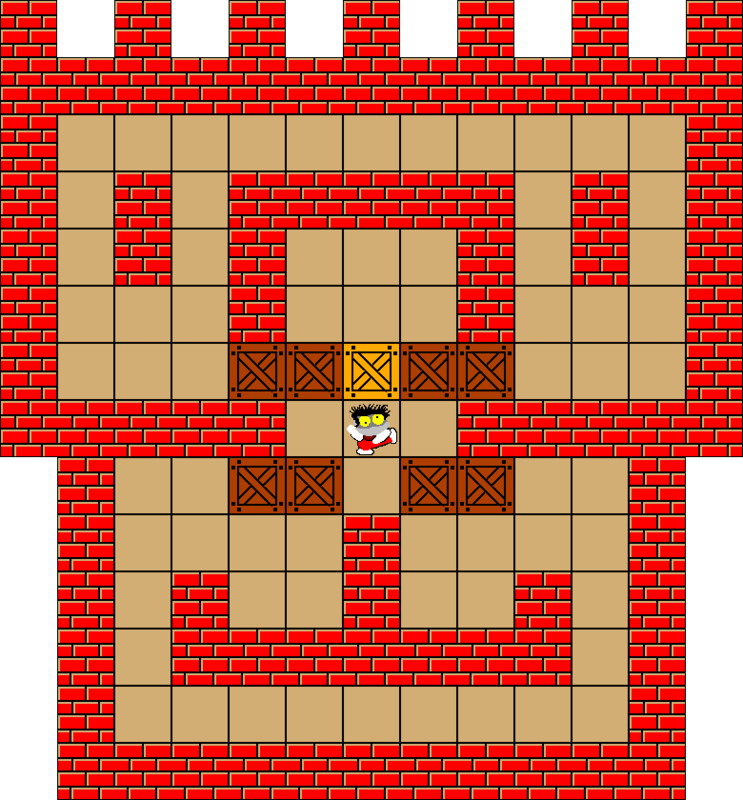 In the last version of Big Phi he found 5. 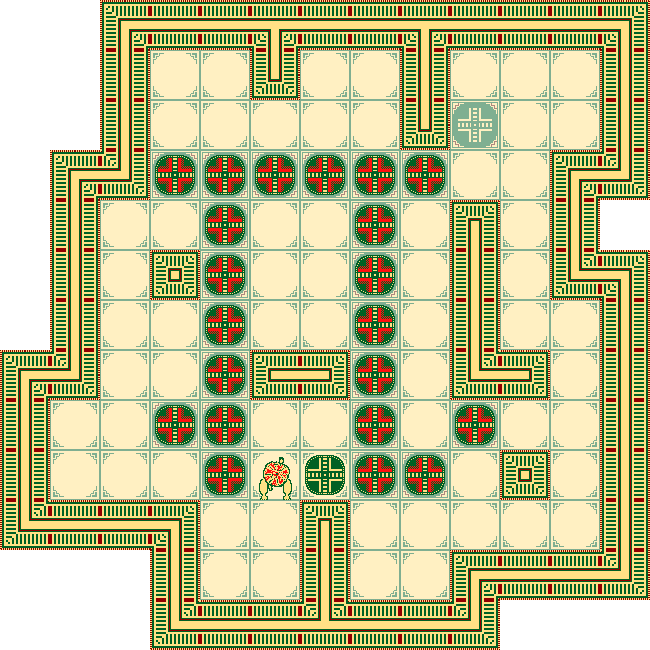 I don’t think it is possible to make this level without flaws with the chosen layout of the goals but I think I can manage better than 5. How to find the flaws? Solve the level and run an optimizer. Anything that doesn’t move? That’s a method and surely you will find something once in a while depending very much of the solution you found. Doing a little analyzing you will get closer to a final result. Doing a lot of analyzing you might get to a final and exhaustive result. 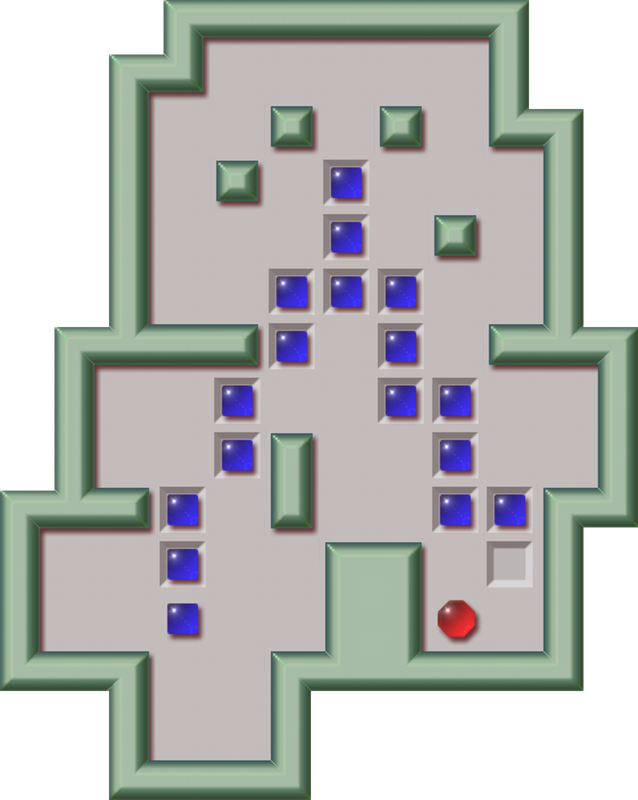 What is absolutely needed to move to solve the level? A not very advanced analysis reveals it is absolutely necessary to move the black numbered boxes and it might not be necessary to move the blue numbered boxes. You should realise box7 is a keybox. 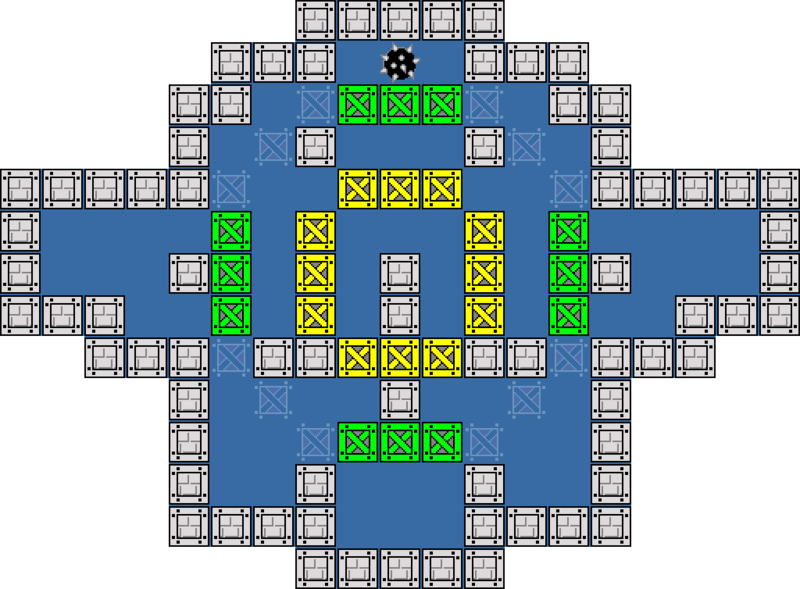 Without moving it you can’t get acces to the middle lower part of the level. Getting acces to box7 you need to move box17 or box22. Box7 need to be moved 2 steps to the left or right (Doesn’t matter which way). Later in the solving you need to get box7 back to a goal somewhere. To do that you will eventually realise you need acces to both sides of the level. Forget about the symmetry for the rest of this text. Just decide you will solve the level by moving box17 to get access to box7. 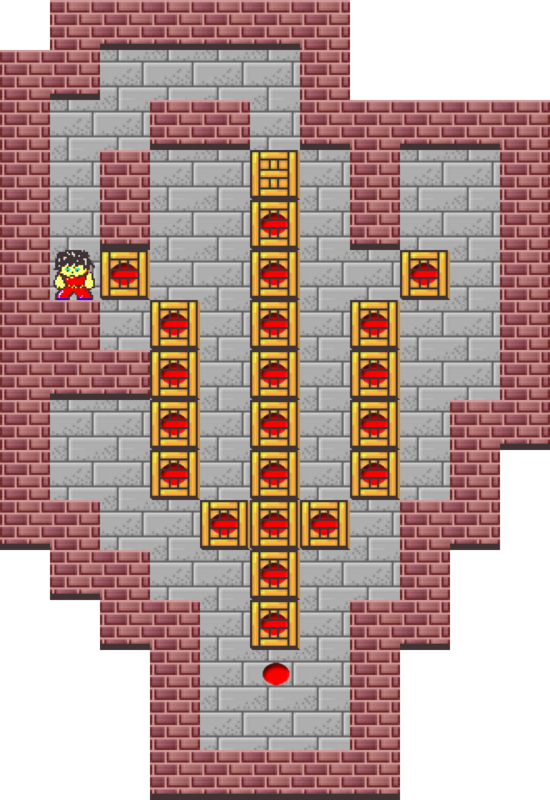 Doing this it is obvious you need to move all the boxes box13-box17. How about the left side? Same thing? Some careful thinking reveals it doesn’t seem to be mandatory to move box26 but then you have to move box21. 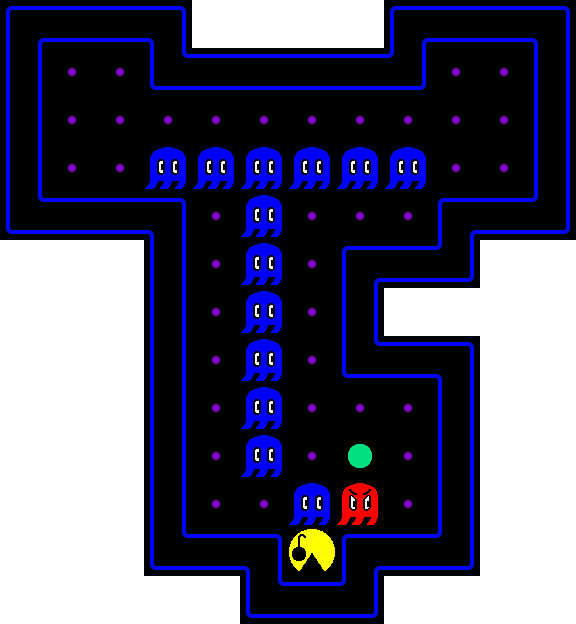 Vice versa – You might choose not to move box21 but then it is mandatory to move box26. Lets have a look at the central column of boxes. A little thinking reveals you need to move all the boxes box1-box6 to get a box at the bottom position and to rebuild the column. I will leave you to do your own logical thinking at top of the level and eventually you will end up with the above layout. I found a solution with no need to move box9 and box26 but I think other combinations are possible and maybe with more than 2 flaws. Any thoughts about the different versions of Big Phi? I find it interesting constructing levels it is often the simplest looking version that is the hardest to solve. At least one box need not to be moved. 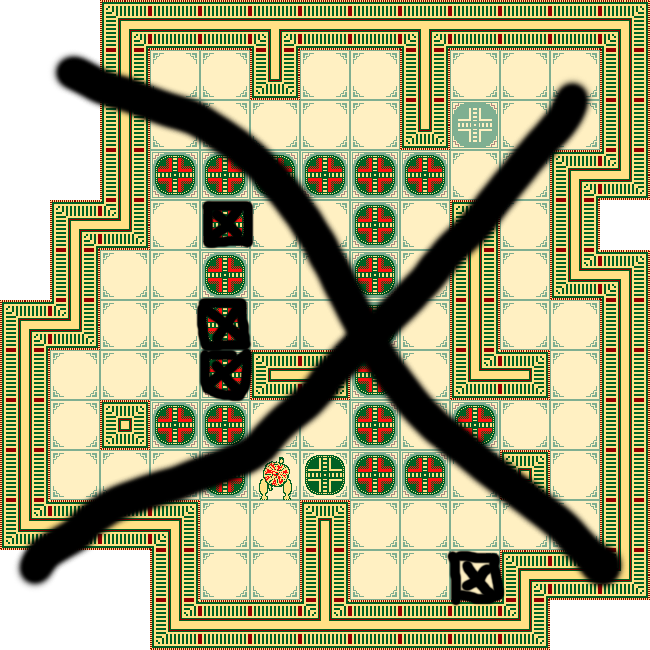 You can’t solve the level without moving 13 boxes! Comment: Not my best concerning numbers of boxes not needed to move. At least four. 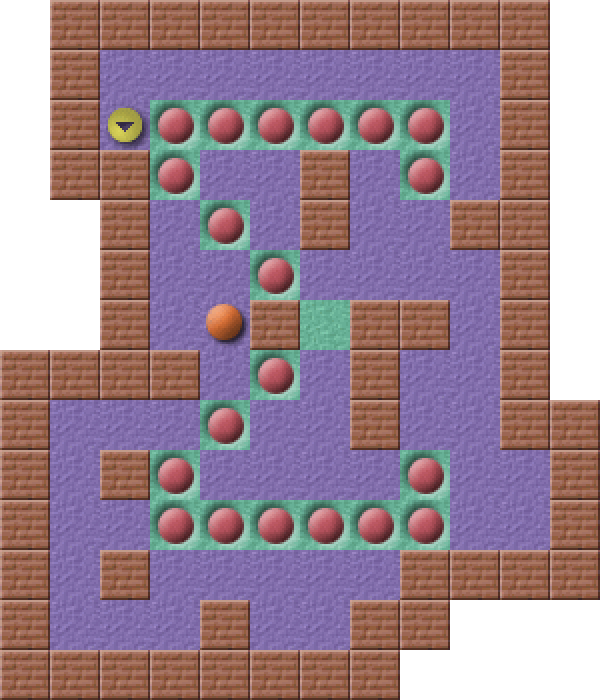 Think you will enjoy the level anyway and tell me if you can solve the level without moving 5 boxes or more. Comment: I didn’t check if this one is made before but I guarantee it is not. Not difficult. Readers at Sokoban.dk will solve the level without too much effort. Lots and lots of remade levels. 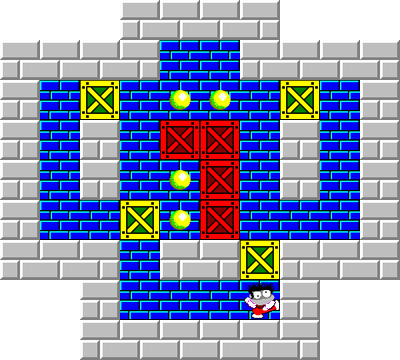 A reinvented level is a level with a layout so simple that it is possible to believe the author invented it himself/herself and published it even if it was already published by some other author. 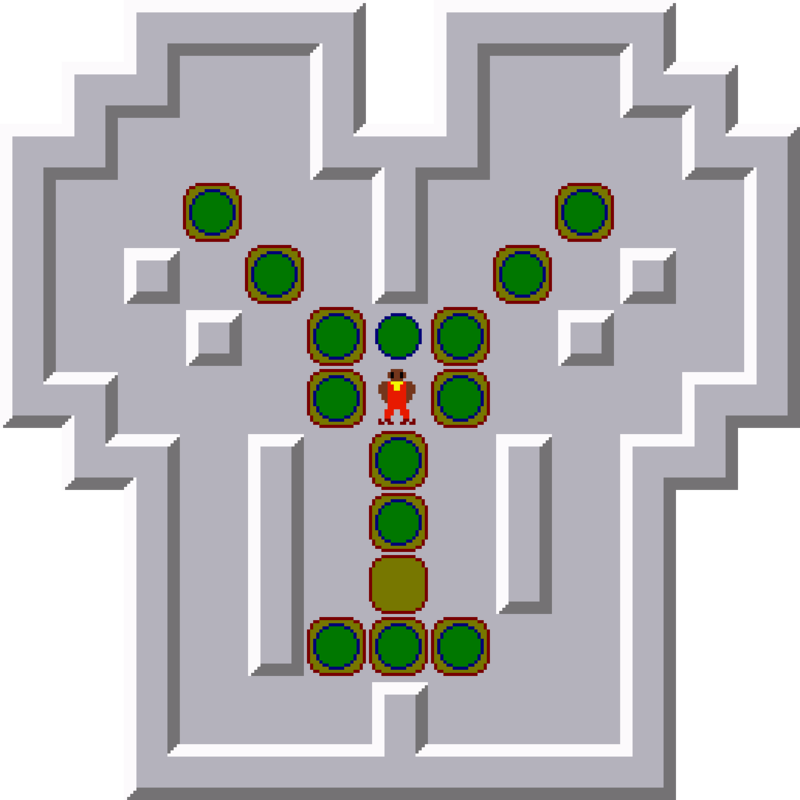 When the levels are not very symmetrical and when there are about 4 boxes or more, you will most of the time create a brand new level never done before. I thought so when I published Merry-go-round. I checked the level against my level collection (Bigger than Letslogic or Sokobanonline) and found no match. But very close. Only the layout of the boxes differs a bit. The solution is basically the same. Thanks to Jordi Domenech for pointing that out. And not thanks to myself for only looking for “Exact match” but not “Similar level” with YASCs copyfinder. 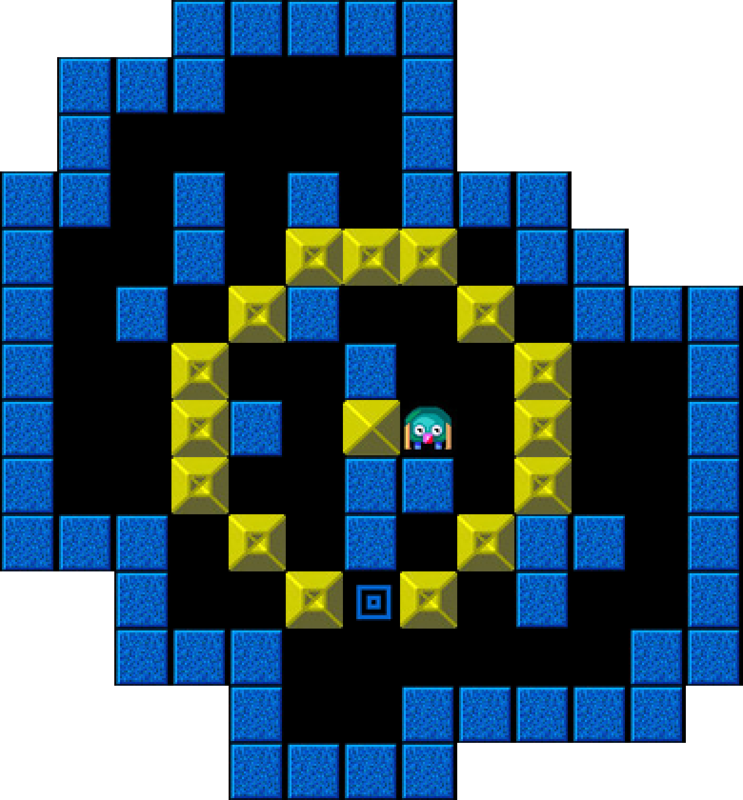 Comment: Sokoban has been around since 1982 and yet nobody created this simple level before. 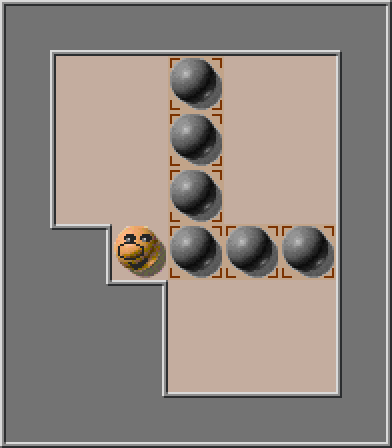 My work bored me so I made a new level for you instead. Xi didn’t come out as I wanted. Can be solved with way fewer moves than I thought. 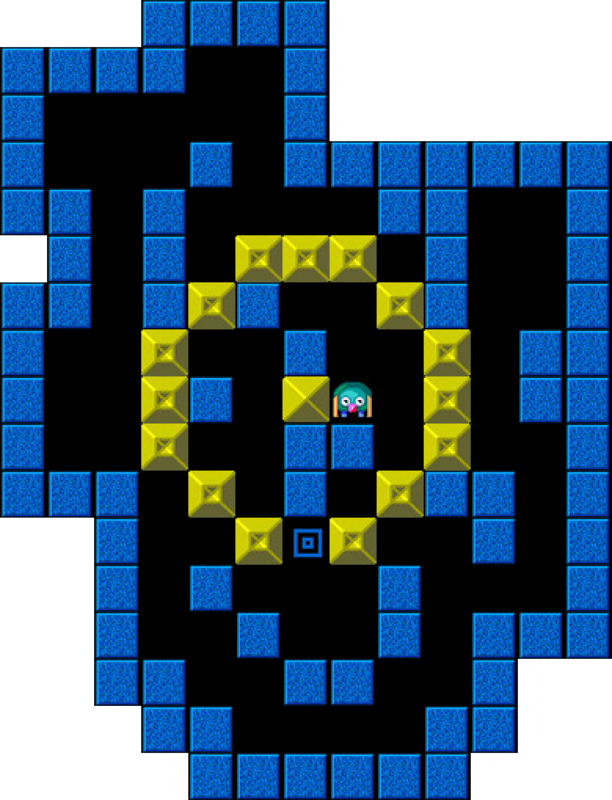 And Anian proved the level can be solved without moving at least 7 of the boxes at all. Title: Xi Hard – Take That! Comment: With no boxes unmoved my best solutions are 305/92 and 360/84. 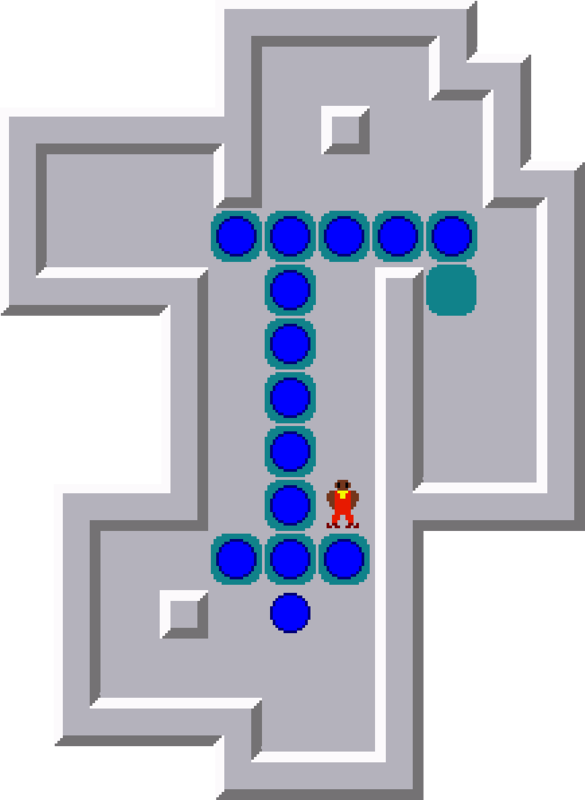 If you manage to solve this level without moving every box I will treat you to a swedish lättöl on any bar of your choice in Copenhagen. 07:30: I owe Anian a lättöl. But at least only one stationary box is possible. Isn’t it wonderful. 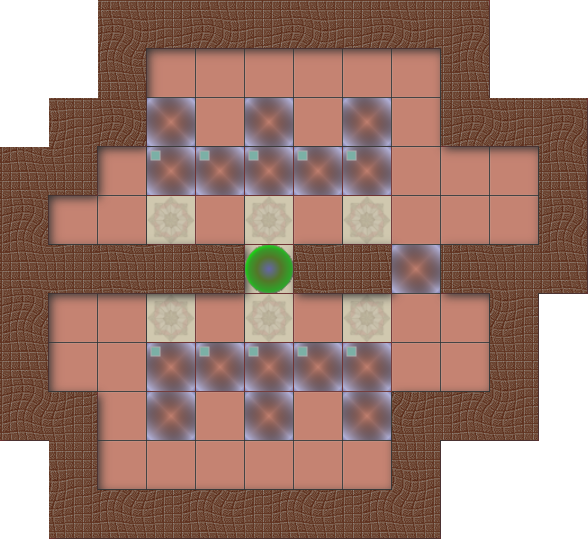 Playing around with some walls and boxes and eventually out of nothing you carve a beautiful level. I had this feeling tinkering around with something not very useful and suddenly the right stuff emerged. Just had to be honed a lot and presto. I got Xi (Big). But I am still pleased to announce you have to do all the solving yourself. No solver succeded. Bricks aren’t blue. Are they? We already got Boxworld Indigo. Now we got Boxworld Red. Once in a while a new author pops up. Usually making af few levels and then disappearing again. A few continue to make new levels. Above Nebula Level 02 published 2018-12-22. Sokolution managed to solve 14 levels out of 17. But that doesn’t reveal much about the difficulty. 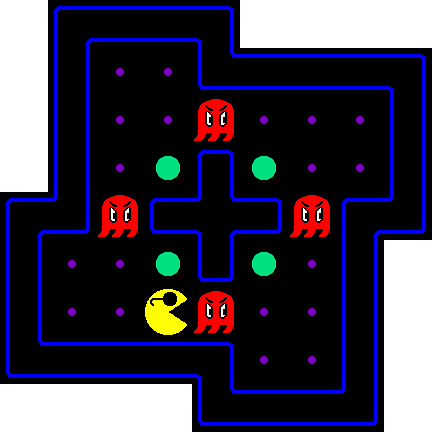 Solvers might easily solve levels troublesome for humans and vice versa. I hope Nebula (She or he? 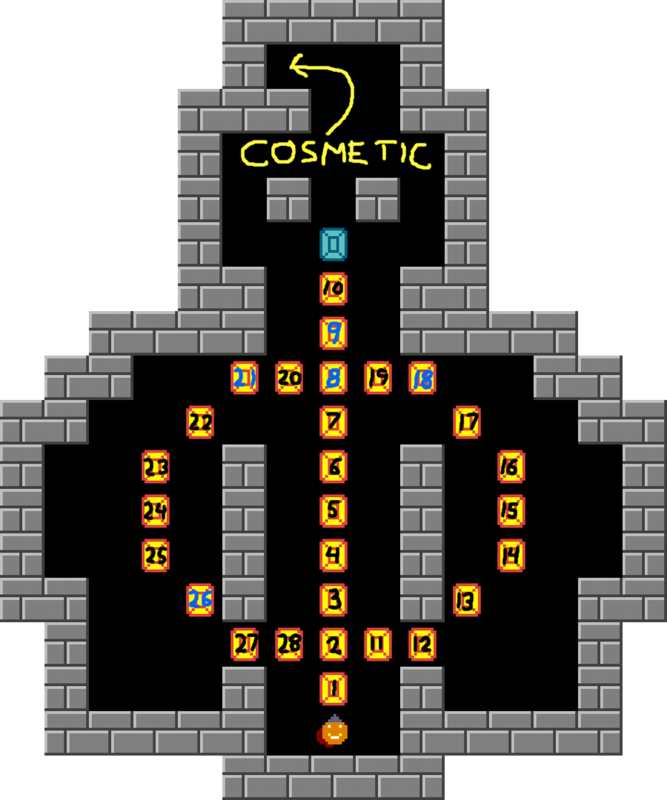 Not many women constructing Sokoban levels) will continue publishing new levels. First Matthias Meger send me a solution for Omicron where 2 boxes don’t need to be moved. 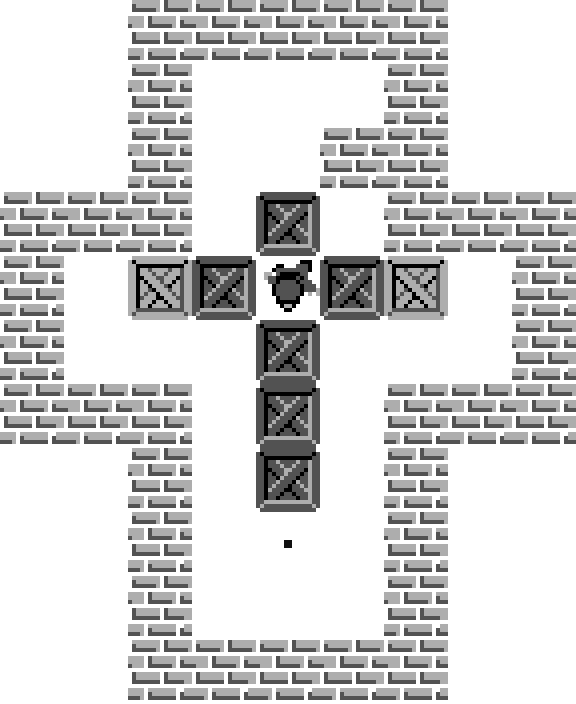 Didn’t find it yet but redesigned the level. Try to find any boxes not needed to be moved in the level below! And no [5,10] doesn’t count. Just a trap to lead you into a cul de sac. Comment: You can use any autosolver but where is the fun then? My best optimized solution 160. Comment: You thought it is an O ? Or a 0 ? No ! It is the greek letter Omicron. I think you should challenge yourself but it is easy to cheat since you can just let Takaken do the job. All other noteworthy solvers failed. 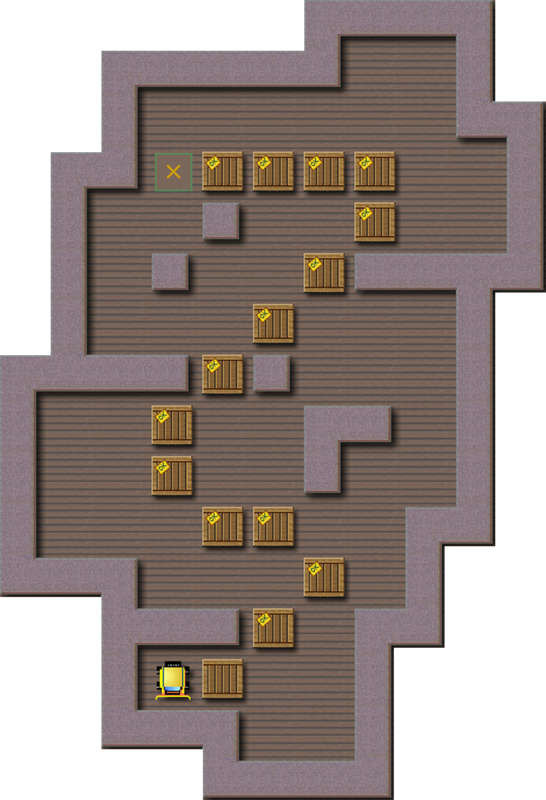 Tell me if you can solve the level without moving two boxes. Skin: Sokofun 1.a. Laurent Brassard made this nice skin with graphics found in the Sokofun program folder. He wrote to me he made 12 skins. Looking forward to see the rest. If you like Thinking Rabbit (I think you do) you should go to Jordi Domenechs Blog. Jordi remade Thinking Rabbit levels of which many have previously been published in the collections “The Beautiful World of Remodels” and at the Sokoban.org website. Now you get it all in a special collection. And be sure to refresh your favorite Sokoban program. JSoko, YASC and YSokoban came in new versions within the last month.